The Rivergods close out a great season of ‘Tunes on the Dunes’ at Westerly Town Beach on Monday, August 15 from 6-8 pm. In a season that saw members of the Byrds and Barry McGuire (‘Eve of Destruction’) play, along with Al Stewart; we are poised and ready to rock the beach! The show is FREE with free parking starting at 5pm! Hope you can join us in Misquamicut… rain or shine! (Rain location is in The Windjammer). More info. 629 Montauk Avenue, New London, CT – FREE SHOW! Yummy! The Rivergods return to Michael’s Dairy Friday, Aug. 19th for our annual gazebo show. Bring some lawn chairs and the fam for some tasty tunes and treats! Did we mention there’s ice cream?? Always a fun night… this is our fourth or fifth year playing there. FREE show! C’mon out… more info. Also, on Friday, August 19, Rivergods’ singer/songwriter Nancy Parent joins fellow Good Sponge recording artist Sue Menhart for a special lunchtime acoustic performance on the Parade Plaza in New London from 12-1 pm. Grab your lunch, and c’mon out for a harmoniously scrumptious time. More info here! 568 Poquonock Avenue, Groton, CT – No cover! 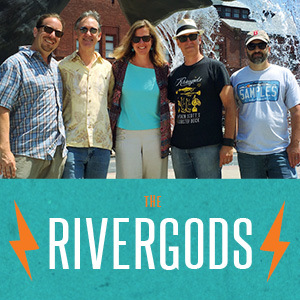 The Rivergods are back under the moose for another Hump Day Spectacular Wednesday, Aug. 24! This is always a fun show for us… loose, friendly with great food and great people. We’ve got some new songs we’ve been working on that we’re gonna bust out… who knows, maybe you’ll even see a special guest or two. And it’s FREE! No cover, as always. And early… 7-10 for you workaholics. See you there!